Chris Lewandowski, DDS, PC, is a talented cosmetic and family dentist in Scottsdale, AZ who has created a practice well known for first-class patient service and modern dental care. Dr. Lewandowski truly enjoys being a dentist and loves getting to know his patients while watching their lives grow and change. Maintaining a light, fun, yet professional office atmosphere, Dr. Lewandowski practices as a highly skilled dentist with your best interests at heart. 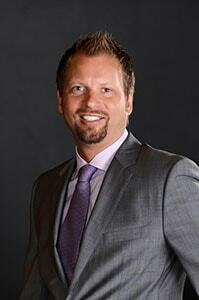 Learn more about Dr. Lewandowski and his professional and personal background below. Born and raised in Seattle, Dr. Lewandowski comes from a busy household being the youngest of four boys; He attended the University of Washington both as an undergraduate and as a doctoral student, graduating from the prestigious School of Dentistry in 1997. After years of overcast skies and drenched shoes, he moved to Scottsdale in 2000 to bask in the sun. Post-graduate training from the esteemed Las Vegas Institute for Advanced Dental Studies has led to Dr. Lewandowski’s special passion for smile makeovers. Utilizing over 20 years of clinical experience, he strives to ensure that each patient visit is a comfortable one and that the highest measure of quality is being performed. He finds dentistry very rewarding by practicing to this standard. His family includes his beautiful wife, Ashlee, and his two boys, Bode and Luke. Weekend fun includes golfing, biking, hiking, swimming and all kinds of racket sports (badminton and pickle ball are in favor lately). You may also find him teaching his rescued English bulldog, Bruno, a new trick or two.